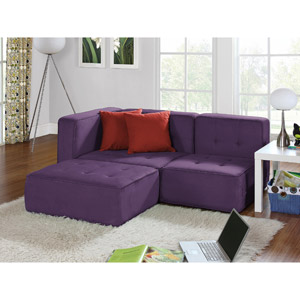 Fully flexible and endlessly easy, this cushy microfiber suede couch changes it up to suit your needs. With two armless chairs, one corner piece arm and an ottoman, the choice is yours. Use it as a comfy sectional or as a kick-back couch with an ottoman, move the arm to either side — or separate all the pieces and spread out all over your room. With a solid wood frame, reinforced brackets and thick foam padding, it is as durable as it is comfortable.